http://www.waldorfbooks.com Susan Perrow has developed the art of pedagogical stories to a luminescent degree. In her beautiful book she offers dozens of stories, some her own, some traditional and retold by her. Each story carries with it the seed of healing for just about any childhood problem, from unruly behavior to deep grieving. Her voice is one of warmth and caring, her stories are richly engaging to young and old alike. Having her book at hand is like having a medicine chest filled with homeopathic remedies for all conditions - and, like homeopathy, Susan's stories are guaranteed to produce no unwanted side effects. Healing Stories includes chapters on creating stories and on the art of storytelling, as well as stories selected for their ability to heal.This is a resource that is so vast in its usefulness that we predict it will become one of the most sought after parent/teacher resources ever printed. The art of storytelling is on the increase today, nourished by such people as Susan Perrow and Nancy Mellon who have encouraged so many to find the storyteller that is in us all. But there are so many attacks on artistic endeavours by today’s electronic consumer society. Why should parents, carers and teachers tell stories when there are so many DVD’s, CD’s and on-line materials available? Reading this book will help to answer that question. Storytelling is still important. Sometimes it can seem to those of us who work with children that what we would like to bring is becoming more difficult – the powers of imitation and for self-initiated play are dimming, simple equipment and activities can appear to be less appealing to sophisticated modern children and young people, but storytelling and the acknowledgement of the power of storytelling is having a resurgence, for adults as well as for children. Books such as this one make it clear how this art can provide a positive approach to the challenges that cluster around the development of children and young people today. empowered as obstacles are overcome and a resolution achieved. There are stories and outlines here for situations from the intimate to the global, from bed-wetting to earthquakes. The suggestion of healing stories for great disasters like tsunamis, earthquakes and wars is a new step for Perrow, but a very relevant one to bring to our attention. She is also now able to suggest stories for sensitive issues such as sexual abuse and premature sexual activity, through her work in so many places in the world where healing is badly needed. Many of the stories in this book, due to the places where Perrow has been most active, are set against African or Asian or Australian backgrounds – but this does not make the book any less relevant for use in other places in the world. There is plenty of encouragement for the individual storyteller to adapt and alter to suit individual circumstances. On the other hand, there are so many global connections all around us now, in just about every kindergarten, children’s centre and neighbourhood, that stories from other cultures and places are a help to extend beyond the simple ‘house and garden’ stories that provide the starting point for the very first story adventures for very small children. Then take the main character on a journey, very short and simple for the youngest children, and introducing more tension and complexity for older audiences. Finally, it is vital to resolve this tension with a happy and satisfactory resolution. There is plenty in the first section of the book about story-writing, though this is only two chapters long, and the remaining sixteen are devoted to the stories, including some poems, games and story outlines. There is a storyteller and story-maker in us all. It is part of our everyday communication when we come back from any outing and tell our family what we have been doing, when we share experiences from our lives with friends, and when we search for the words to share new ideas with colleagues. Perhaps storytelling was accidently given a bad name for us as children. Someone might have said to us, ’Don’t tell stories!’But really we are not able to live in community with others unless we communicate, and, though we want to avoid encouraging the ‘fibs’, ‘tall tales’ or ‘lies’ implied or in the admonition, anything beyond our most basic communication is a story of sorts. As soon as we tell even the tiniest story, we begin to share our soul in a uniquely human way. This book also takes time to look at some of the dangers for the story-writer. There is a warning about creating the moralising story rather than working in a lively way with moral themes. We are also warned that the desired enduring changes that we hope for may not come quickly and may well require some transformation work on our own attitudes. There is an interesting section that would benefit from further discussion amongst storywriters and storytellers, on whether it is manipulative to attempt to change children’s behaviour through a story. After all, the power of stories could be used unethically, for example, to spread a negative attitude and consequent behaviour. Rabble-rousers use stories. Fortunately, Perrow has a very apt, though mild example from one of her workshop participants, to bring out for us the difference between seeking to heal an imbalance, and pursuing a more selfish aim. There is also a section in this book on how to change inappropriate stories that children may have been given. Changing a fairytale is definitely not to be recommended, despite the Disney-fuelled wish for real evil and its consequences to be downplayed, but Perrow’s account of the new positive ending for the frightening movie story that a child was left with is again very aptly chosen and most helpful. As a storyteller, her way of writing is lively and enthusing. Therapeutic Storytelling is about the power of words, not as intellectual tools to build abstract concepts, but as the source of living and flexible pictures that our responsive imaginations create. It offers stories for everywhere and for all ages. It gives clear ideas and encouragement for story writing and information about how to use stories in a playful and lively way, in everyday family life as well as in very difficult circumstances. I hope that Therapeutic Storytelling will find its way into many homes and centres where children are cared for and I don’t doubt that it will become a well-thumbed volume. Children love stories. The nature stories and fairy tales we share in our early childhood classes provide a daily soul nourishment. There are also the “pedagogical” stories we create spontaneously to picture to the children a more healthy behaviour when something is out of kilter in the moment. In this new book, Therapeutic Storytelling, Susan Perrow takes us a step further to introduce therapeutic stories. Susan is described as a “story doctor.” She has done her work as story teller, early childhood educator, and teacher trainer in Australia, New Zealand, the British Isles, South Africa, Kenya, Eastern Europe, Asia, and China. In her story telling workshops with educators, therapists, and parents, she has shared many stories and the tools each individual needs to create stories for our own children. She gave the introduction to this type of story in her first book, Healing Stories for Difficult Behaviours. Now this volume expands with examples of 101 stories that have arisen out of her own creative work and within workshops she has guided in different countries. But first, what distinguishes a therapeutic story from others? To quote from the book: “All stories are potentially healing or therapeutic. If a story makes people laugh or cry—or both!—the laughter and tears can be healing. Folk- and fairy-tales, through their universal themes and resolutions, have healing possibilities. They can offer hope and courage for facing the trials of life, affirming our capacity to change and develop.” She goes on further to say that therapeutic stories are specific stories to help or heal behaviour in a specific situation when wholeness has been lost. These are stories that “return balance…to a behaviour or situation that is out of balance.” Her description of this resonates with our own experience of the power of stories as a way to address difficult topics and situations through the vehicle of “an imaginative journey” that guides toward resolution. The story can be a way to encourage a new behaviour by picturing through the story how to do it without lecturing or moralizing. The child’s dignity is protected while his or her higher being is invited forward through the story imagination. Each story will have three essential elements—metaphor, journey, and resolution. Metaphor is the imaginative picture. Journey is the series of events leading to a conclusion. And resolution is when balance is restored. One problem situation described in the book was of a 3-year old child who bit others. The main story character chosen was a baby hippo who greeted everyone with a bite. But no friends stayed; the zebra, giraffe, and baboon all ran away. But when the baby hippo tried to bite tortoise, his shell was hard and hurt her teeth. He did not run away but invited her to eat good, sweet grass instead. Once she learned to enjoy eating grass, “When her friends would come to play/ The friends would stay and play all day!” The book further discusses the “mystery and magic of metaphor” as it “speaks directly to the imagination, building its connections through feeling rather than theory or abstract thinking.” Further suggestions are given as to how to create our own stories and get our story juices flowing, of different ways of constructing the journey, of what kind of resolution is healthy and proper. The first 50 pages of the book give the story telling “tutorial.” The remaining 200 pages are stories, stories, and more stories. The list of categories is exhaustive and runs the gamut from hitting/biting, anxiety/fearfulness, bullying/exclusion, social conflicts of all kinds, divorce, resilience, sexual abuse, bad language, to discrimination, and more. Some of the stories may be just what a teacher has been looking for to address a situation. Others may seem too direct, others too subtle to address the topic. Susan emphasizes that it is also important to understand that the children’s behaviour is contextual and relational. A story in this book may not be “the” answer but can give us inspiration and spark the imagination of what will speak to the children in our care. While reading Therapeutic Storytelling, I began to flag individual stories to mention in this review. When 15 stories had already been tagged and only half of the book read, the tagging stopped. There are too many inviting stories to mention. This collection invites individual exploration to find the treasures you may be looking for. Thanks to Susan Perrow and the students from her workshops who have generously shared their stories to benefit the children of the world and the parents and teachers who care for them. Therapeutic Storytelling is published by Hawthorn Press. 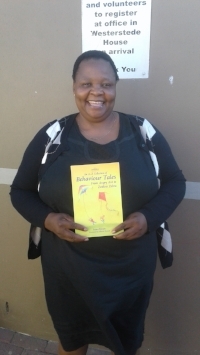 "Thanks a lot for the book, it so helpful to all the teachers and me, I read it with such interest!" Peter Nyagaka from HIHA PRE&PRIMARY SCHOOL, ARUSHA- TANZANIA writes 'thanks so much for writing the book A-Z collection of Behaviour Tales. It is such an interesting story book. I and my pupils have really enjoyed it. The most interesting stories my pupils have liked are @bored baboon,@No-no nobby,@Hurting Hippo,@Boss Bulla,@X-tremelyDominant xylophone,among others. Bless you and your good work that you are doing. My pupils are saying big thanks! This review was written in November 2017 by Imelda Almqvist, an author and teacher, for Pagan Pages. Many thanks to Imelda for her wonderful review, and Pagan Pages for hosting it. On the back cover she is quoted as saying that the stories may not be “magical pills” but they can be a wonderful alternative to nagging or lecturing. Now any parent, teacher or counselor is going to appreciate that!